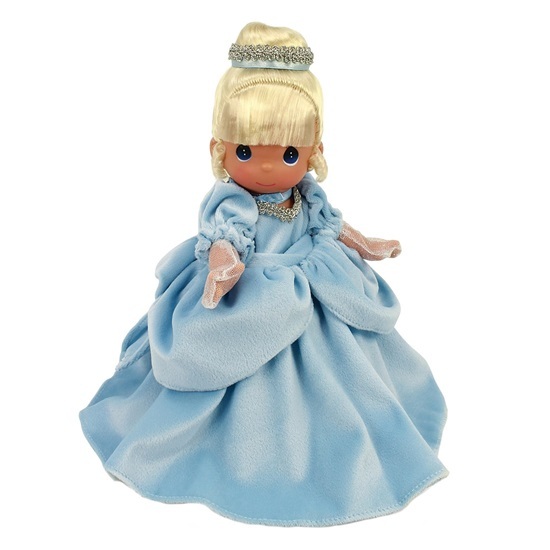 From the beloved Fairy Tale, this Officially licensed Precious Moments vinyl doll designed by Linda Rick, The Doll Maker is sure to steal your heart. Every fairy tale deserves a happy ending and this lovely little fairy tale princess is the perfect way to remember this classic. Enchanted Cinderella is ready to meet her Prince Charming dressed in a baby blue velour gown with metallic embroidered trim around the v neckline, and a billowy net underskirting. Her blonde rooted hair is swept atop her head in a bun circled by a blue satin ribbon with metallic embroidered trim. She has painted blue tear drop eyes and a gracious painted smile. Delicate sheer metallic gloves and silver mary janes complete her tale inspired look. She is 9 inches tall and is jointed at her neck, arms, and legs. She is another beautiful creation by Linda Rick.